Rakhmawati, Supply Chain Management student in her 8th semester has become YSEALI (Young South East Asian Leaders’ Initiatives) participant, provided by US Department of State and launched by President Barrack Obama himself. The YSEALI program is the advanced program for all the US exchange alumnus offered by US Embassy. Previously, Rakhma received a full scholarship as a US Exchange student for YES program in 2008-2009. The program’s aim is to remove misunderstanding between Muslims and US citizen and it was launched after the 9/11 . YSEALI is a program that has been launched by President Obama himself. YSEALI 2014 was actually the first event and workshop that has been provided by the US Department of State. This program invites all of the young generation that come from all ten countries in ASEAN to gathered in Kuala Lumpur on April 25th-29th. This program required the participants to create and pitch the project to the US Department of State to get the grant. The project itself was focusing on four fields, they are: education, civic engagement, economic development, and environment. The participants were divided into sixteen groups with five to six people from different countries. During the 4-days’ workshop the participants had a chance to meet new people, selected people from all over ASEAN, and adjust ourselves directly. What are the activities in YSEALI? I arrived at KLIA (Kuala Lumpur International Airport) and met all the committee of the YSEALI. I also met Ibu Tri Mumpuni, she is a social activist in Indonesia. After that me and six Indonesian delegates directly being driven to Double Tree by Hilton hotel in Kuala Lumpur. After i got settled at the same day the schedule shows that we have the welcome dinner. The welcome dinner event i was selected to be one of two performers. The other one was from Philippines performing a song from John Legend All of me and I performed a song from Whitney Houston ‘one moment in time’. Having people done standing applause for me was the unexpected moment. But above all i felt so happy of being Indonesian representative that shows that Indonesia has talent. For the next three days, I joined the workshop in team. We were pursued to get to know our teammates well. This persuasion will benefit the team to make the project easier. Since we already realize that each country has its own problem so we had to come up with one problem that generally define all of the problem that we found in our original country. So my team came up with an idea of the ASEAN story. The reason we chose the topic because we believe that culture is the core value of ASEAN. If we don’t nowhere we come from we will never know where we are going. So basically we would like to provide the platform for all of ASEAN Citizen to share the story, folklores, traditional dance, traditional games and so forth. We believe that education is not about teaching, sitting in class, listening to the teacher and trying to get a good grade. But education is way much more than that. Teaching is different with educating. All the people in ASEAN has to realize that educating is beyond just learning but also daring others to dream. And to reach our dream is to know who we are and what we are capable of. And to know who we are is to understand where we come from and the core value of being one. What did you get from YSEALI? Making project is not a simple thing but it is where it all began, the hardest part of the whole process is to pitch our project. That is when we have to explain people that our project has many positive impacts to the community and also tangible. Pitching the project is like selling our project or promoting our project to get the sponsorship. To make the project become real we surely prepare the budget and that is when the sponsorship is required to fulfill how much budget we need. This also is some kind of practice for me especially for preparing my final project. Technically help me to practice the defense that I will face after the final project is approved. But generally I get to understand that every project has its own goal. Therefore to reach that goal every participant in the team should be involved and passionately work on the project. Finishing the project doesn’t have to be serious in each and every process there should be a recess time, break time, play time to refresh the idea. And that idea could be the adding value of the project. What is the most exciting moment in YSEALI? First, I never expected that President Obama will come to give a remarks for all the YSEALI participants. So before I departed to Kuala Lumpur I was just expecting that is event will be another international experience for me. 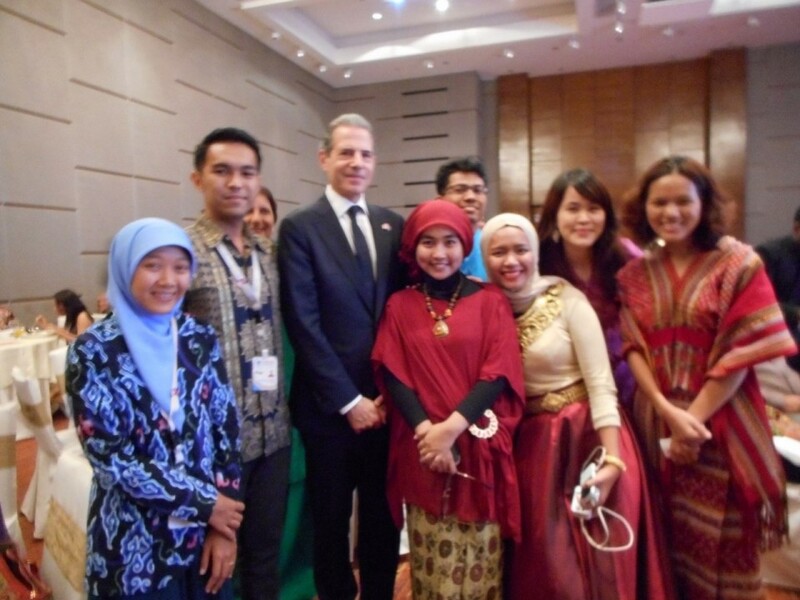 But then I heard that President Obama will come exclusively to meet all the YSEALI participants I was so thrilled. 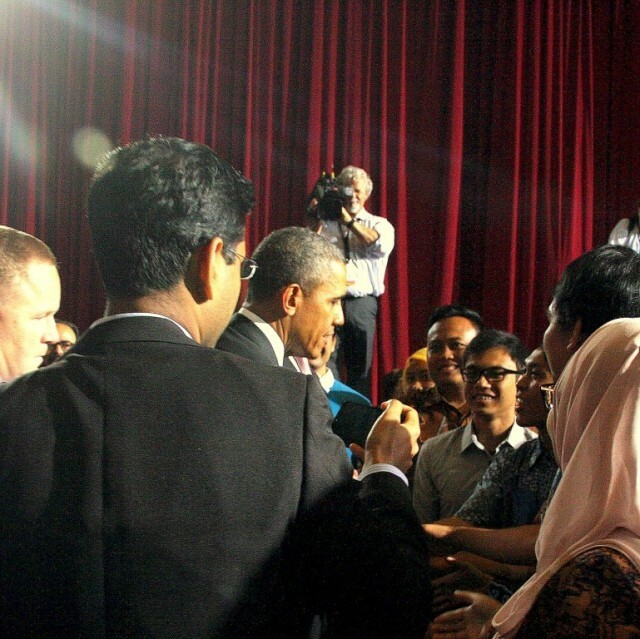 So at April 27th all of the participants went to Universiti Malaya, town hall, to meet President Obama. After President Obama gave the remarks, he was planning to directly go to the back stage but all Indonesian delegates decided to shout “Bariee.. Bariee….shake our hand”. As we never expected President Obama ran towards us and shook our hands and spoke with Bahasa.